Q: Many studies have looked at the health and social benefits to dog ownership, including that walking with a dog increases the time spent in that activity and the degree of commitment to it, have you seen evidence of this in your own family? A: Bo has been such a positive addition for our family. I think of him as my third child because we all love him so much. Whether we’re teaching him how to roll over, swimming with him in the summer, or watching him greet kids who are visiting the White House, he constantly keeps us smiling. Of course, I understand the political logic underlying this kind of interview: Any exposure that presents the First Family as more relatable than the notoriously stiff Romneys is a political boon for Obama. 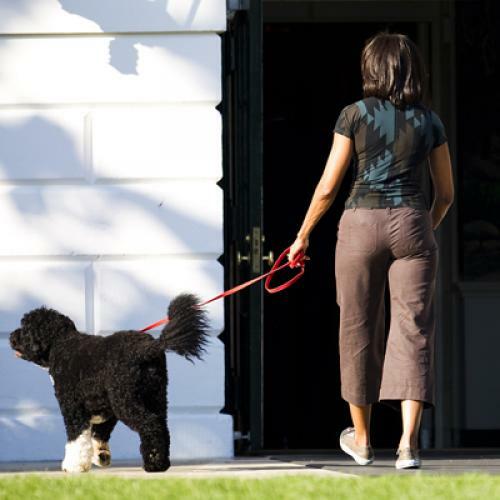 (As is anything that triggers memories of Mitt Romney’s history with dogs.) Who knows, maybe dog lovers are a previously unrecognized bloc of swing voters. But from a First Lady who has always seemed her husband’s match when it comes to political prowess, it’s hard not to recognize the Bark interview (hitting newsstands this week!) as a new low. I wasn’t expecting a tell-all, but a tell-something would have been refreshing.